Wow, this is how I remember winters from when I was a child. 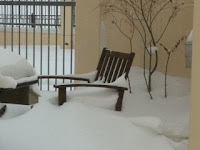 Check out my last post to see the first photo of this chair on my back patio to see how much snow has fallen! The funny thing my children noticed, though, is that since the children walk to school here, it is right on our village camp, there are not any "snow days"! Good thing my refrigerator is stocked! 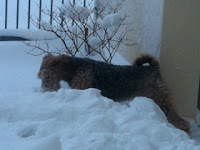 Bella is interesting in this weather...she like to play in it for awhile, but then her paws must get really cold because she barks to come in. A different type of fun for us, but still fun all along! 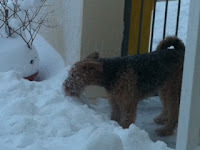 That is a really beautiful snow!!! I miss the snow and the change of seasons. I am from the east coast myself sand remember such days, accompanied with hot chocolate and buttered toast. It's great your kids get to enjoy this! PS: those jellyfish were actually those colors, clear, white and silvery with yellowish orange "lights!"